At Numi Yoga on November 3, I am leading a mixed-media mandala workshop. To prepare for this workshop, I have painted several mandalas and observed the history of these hypnotic images. Altogether this has been a new experience for me, and now I can’t stop drawing these! No two are alike. The Sanskrit word “mandala” is loosely translated to mean “circle.” Hindus were one of the first people to use the mandala spiritually, but the mandalas that most individuals find familiar are ones made by Buddhists. In many cultures, the circle represents infinity, but a mandala represents more than simple geometry. Mandalas represent the infinite universe, and wholeness within one’s self. The owner of Numi Yoga, Kelsey, and I brainstormed together for a painting party image that would reflect the restorative qualities of yoga. 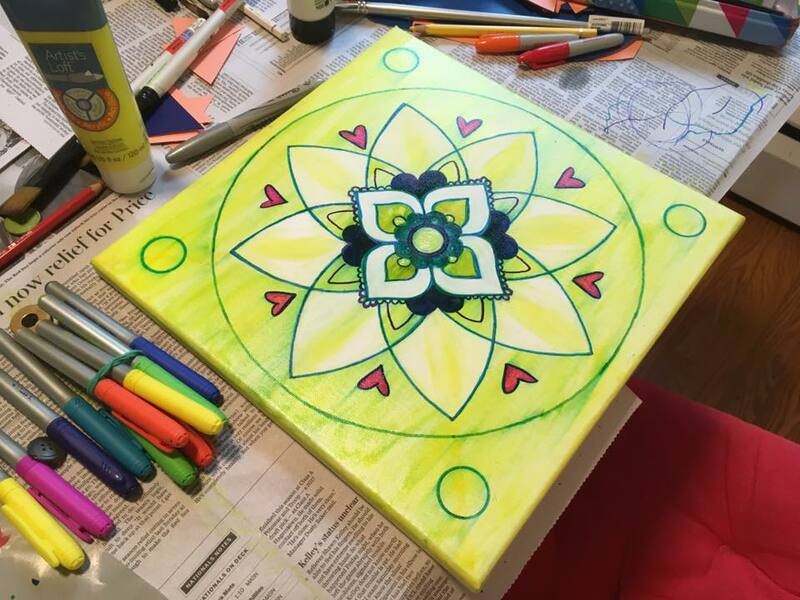 Not only is the mandala tranquil, but relatively easy as an art project. I want people to relax during this art experience! The creation of a mandala can have significant meaning for any individual, especially those who enjoy meditation. For me, any type of painting or drawing activity is meditative. The purpose of our mandala-making at Numi Yoga will be relaxation paired with the fulfillment of learning a new skill. It will be an experience not to miss. I hope to see you at Numi Yoga on November 3! Click here to purchase tickets through the Numi Yoga Workshops page.